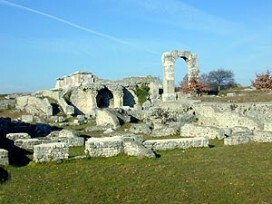 Carsulae, an ancient Roman town erected along the course of the Flaminia Road, was abbandoned long-ago because of serious landslides which had rendered it necessary to move the seat of this important consular road. Not all of this interesting archeological area which is situated between Terni and Sangemini has been brought to light. However, the Forum area with the ruins of the basilica and of the Twin Temples, the Theater and the Amphitheater, both of which are quite well-preserved, are visible; also the very beautiful arch of St. Damian, and further on, very interesting sepulchral monuments. Right next to the Forum the beautiful medieval church of St. Damian was built by using the archeological materials found within this area. Visit and Documentation Centre "U. Ciotti "
- They are entitled to reduced ticket type B (the archaeological site of Carsulae and integrated ticket) European Union citizens who have not be eighteen, groups of students in Italian schools and other EU were accompanied by teachers, lecturers or students of the faculties of architecture, preservation of cultural, educational sciences, literature and philosophy courses (Bachelor of Arts with an archaeological or historical-artistic) and academies of fine arts, all other persons or classes of persons provided by state law. - They are entitled to free ticket citizens residing in the town of Terni in the municipality of San Gemini, the disabled and their carers, the tour guides, tour guides and interpreters in the conduct of professional staff of the Ministry Heritage and Culture and the participants in the educational activities organized by the Municipality.